We are happy to offer this private suite/apartment for guests who are traveling light and do not need a large space. This suite consists of one large room, one full bathroom and one kitchenette area. We have a new 40 inch Smart TV for your entertainment along with WIFI. The kitchenette consists of a small refrigerator, microwave, coffee maker and toaster. We also have a 40" Smart TV and WiFi. It is a 1 minute walk to the beach and you don't have to cross any roads. Park right outside your own private entrance, off-street. We offer a queen size pillow top mattress. Also included is a twin size air mattress for children or extra guests. This is a family endeavor. George, Kathleen and George Jr. are all working hard to provide a fantastic vacation value. We love our Historic and Rustic little cottage. The location can't be beat as you are about a 90 second walk to the beautiful beach - right out your door with no streets to cross. Located right off the beach. This is for those not needing a large space. It's very clean and compact. This suite has a full size bathroom with bathtub. No roads to cross. 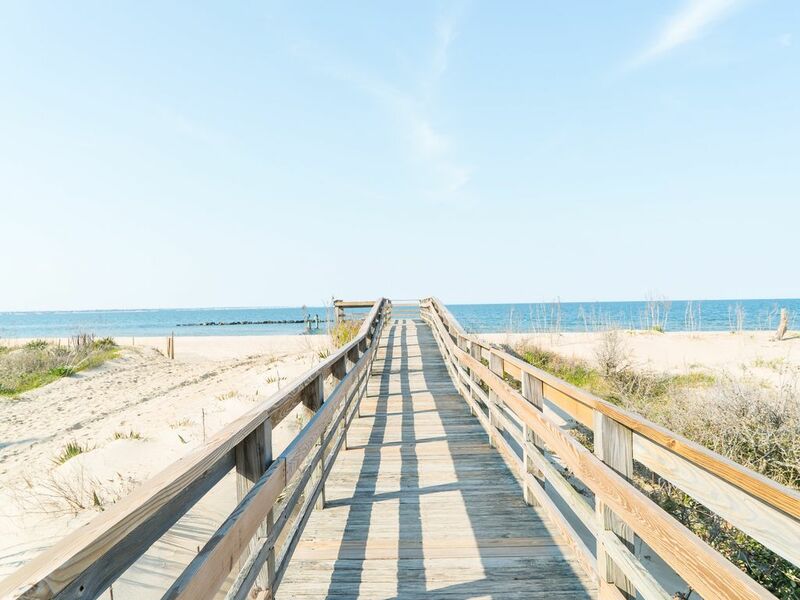 Just steps from the boardwalk which takes you directly to the sandy beaches of the Chesapeake Bay. A small College Dorm type refrigerator is in the kitchen. This is a small kitchenette with just a sink, microwave, toaster, coffee maker, and mini fridge. There is a covered and shaded Patio that is available and possibly shared with other guests. Owners were very responsive. This space was not good for me. Why anonymous? Why 2 stars? Wow! I really enjoyed staying here during the month of February. This is a very cozy apartment. This apartment is relatively small but comfortable with pretty decor and a great bed and tv connected to Netflix and Hulu, etc. George was very responsive to questions and concerns and was great at communicating. My favorite thing to do was to walk on the beach without having to drive there. The sunrises were absolutely gorgeous, and the ship traffic was interesting to watch. This location is also convenient to Downtown Norfolk, Virginia Beach, Hampton, and Williamsburg. There are lots of really good restaurants in the area as well as fun things to do. I will definitely try to stay here again when I’m back in the area. Great little place. Perfect for our stay. I’d would stay here again. Very clean and comfortable. Loved its short walk to the beach. The bed was comfortable. Binged watched some Netflix, walked on the beach and visited my Navy son. Really enjoyed our stay! It is a very close walk to the beach. We enjoyed staying in the Cozy Suite. It was plenty of room for the two of us and our small dog. The bed was comfortable and the shower hot. Loved that the beach was so close and no crowds. A short drive to many points of interest and restaurants. We plan on a return visit soon. one room small but quite comfy. George responded quickly to a minor issue with the door. Only complaint is that I'm old and not a fan of Hulu. Worth the price of admission. We are located in the Willoughby area of Historic Ocean View. Every Amenity needed for a wonderful vacation is provided and available nearby including: Hospitals, Drug Stores, Grocery Shopping and many fun things to do with the children including Museums, Water Parks, and Recreational Parks. To ensure any "early check-in" requests, please reserve the night before. Our cleaners need 2-3 hours per unit to properly prepare for your arrival. Thank you.